Marine-derived protein. Total Nutritional Supplement! 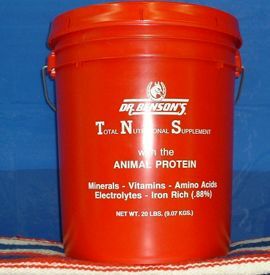 Dr. Benson's TNS is the most complete and balanced vitamin and mineral supplement! It contains the highest quality animal protein providing 10 essential amino acids not found in vegetable protein. This is a complete protein supplement providing 22 amino acids to aid your horse in achieving the optimum condition and peak performance. A two to one Calcium/Phosphorous ratio which produces strong bones. Supplemental Lysine which produces rapid growth of muscular flesh. Supplemental Methionine which may produce a stronger attachment in the laminae via disulfide bonding. Biotin for healthy hoof horns and integument tissue. Selenium which is 100% biologically available and absorptive, protects ,uscle cell membranes and helps maintain hoof integrity. Supplemental zinc which plays a significant role in wound healing, maintaining epithelial integrity, and in combatting inflammatory conditions. Valine, Arginine, Asparagine, Tyrosine, Glutamine, Serine, Asparactic Acid, Leucine, Cysteine, Histidine, Alanine, Threonine, Phenylalanine, Proline, Tryptophan, Glycine, Isoleucine, Cystine, Glutamic Acid, and Hydroxproline.